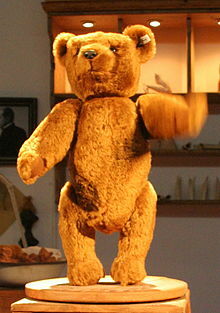 A teddy bear is an example of a stuffed toy. A stuffed toy is soft. It is made from cloth and filled with straw, beans, plastic beads, cotton, or other similar things. Stuffed toys are made in many different shapes and sizes. They often look like animals or cartoon characters. They are often given as gifts for birthdays or holidays such as Valentine's Day. This page was last changed on 22 October 2018, at 21:52.